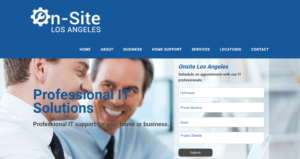 On-Site Los Angeles is a computer repair Los Angeles company. The tech team specializes in diagnosing computer problems and tailoring their services to the needs of clients. Their excellent services include computer repair, installation, and training. To create a recognizable online brand that will attract more clients. To assist On-Site Los Angeles in creating a trusting brand, we created a logo that represented the type of company they were. We then created a website that was SEO and user-friendly. By creating a website that was search engine optimized approved it gave the website an opportunity to appear at the top of search engine results. Once the logo and website were finalized, we assisted On-Site Los Angeles with a media buying campaign. This campaign was created with the goal to attract the targeted market.